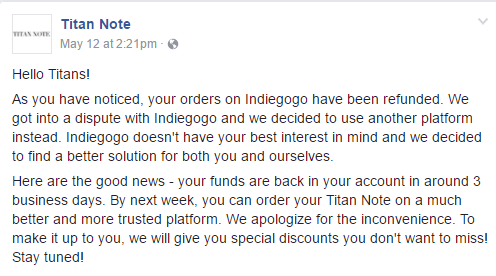 A few weeks back, I wrote about IndieGogo shutting down a crowdfunding project for a small notetaking/speaker device called Titan Note. As I pointed out at the time, there were a lot of alarm bells about the product, but I had still backed it just to see if it might actually work. IndieGogo shutting it down actually had me relieved because the more I thought about it, the less sure I was the project was legit. Making things even more bizarre — and leading to my post about it — was the news that the guy behind Titan Note had sent a bogus DMCA takedown notice to the Verge over its skeptical take on the product. The DMCA notice targeted the use of Titan Note’s promotional images — which are clearly fair use for news publications. As you have noticed, your orders on Indiegogo have been refunded. We got into a dispute with Indiegogo and we decided to use another platform instead. Indiegogo doesn’t have your best interest in mind and we decided to find a better solution for both you and ourselves. The dispute was regarding the payment and the fees. Moreover, Indiegogo has a history of not taking responsibility for the users on its platform. Many are dissatisfied with the Indiegogo platform. It was a wrong move from our side to take orders on the Indiegogo platform in the first place and we truly apologize about that. We promise that we will make it up to you when we relaunch Titan Note on a more trusted platform next week. Please let us know if you have any other questions. More people began to question this, and then he started insisting he couldn’t talk any more about it, because he was going to sue IndieGogo. We are in the process of pursuing legal action against Indiegogo for their misconduct. Because of this, neither we or them can go into more specific details. We appreciate your understanding and we apologize for the inconvenience this has caused you. Somewhere around this time, I decided to ask some questions on the Facebook page as well, noting that the boilerplate claims didn’t make much sense. There’s no reason to expect a dispute about “fees” since IndieGogo is pretty damn clear on the fee breakdown. I pointed out that there’s simply no reason that he can’t explain more of what the problem was, even if a lawsuit was in process — and furthermore, suggested that it might make sense to delay a new crowdfunding campaign until after such a lawsuit was filed, so that backers could better understand the details. Separately, I asked about why they sent the DMCA notice. About the DMCA: We sent the DMCA notice to the verge because they used our copyrighted images without our permission. No reputable publication would do that. They stole our property and we had to take action. I responded to that, noting that this explanation made no sense at all. First of all, the images were promotional images, released for the press. Second, the Verge’s use was clearly fair use. And, finally, I pointed out that this explanation was clearly not true, and the reason for the DMCA notice was obviously the skeptical nature of the Verge’s article because none of the other news articles that were hyping up the Titan Note — and which the company proudly linked to — appeared to have DMCA notices over their use of the very same images. And that’s when I got blocked from commenting on the Titan Note Facebook page and all my remaining comments were deleted (he had already deleted my DMCA questions earlier). So that confirmed just how sketchy this whole project was to me. The DMCA notice was bad. The nonsensical explanations were worse. And deleting some fairly straightforward questions about all of that (and then blocking me from commenting any more)? That’s not a trustworthy project. At almost the exact same time that I got blocked, Titan Note “relaunched” on a supposedly more trustworthy platform, an Australian site called Pozible. The project quickly got to nearly $100,000 in backing. I emailed Pozible to ask if they did any checking on projects, and pointed out that IndieGogo had taken the same project down. Almost immediately I got an email response from someone at Pozible, telling me that their own system had “flagged” the project and they were suspending the project until the creator provided more information. Campaign Owners are not permitted to create a Campaign to raise funds for illegal activities, to cause harm to people or property, or to scam others. If the Campaign is claiming to do the impossible or it’s just plain phony, don’t post it. To clarify, Neither of those platforms have seen our product. The outcome is not a reflection of Titan Note’s quality and again, they have not seen our product. We have had competitors that have posted slanderous information to the platforms and we are in the process of bringing legal action against one of those platforms for their misconduct. We will not let a bump in the road stop our passion. So… yeah. That doesn’t actually answer the question. Nearly all crowdfunding projects don’t involve the platforms seeing the projects, but it’s very rare for projects to be canceled. It certainly suggests something else is up with this project and that’s why they were canceled. Besides, the original story was that IndieGogo canceled over a “fee dispute.” If that’s the case, why would it matter that it hadn’t seen the product? Yes, the IndieGogo campaign had over 12,000 backers and had initially raised over $1.1 million dollars. But that was canceled and all the money was refunded. It seems very, very, very questionable to then go on and put up a website that suggests the project successfully raised that much money when that’s not how things actually ended. Distressingly, the project is also using the various positive press it got upon launching on the website, leaving out the Verge (obviously). Not surprisingly, I am not the only person concerned about all of this. There are still some users in the Titan Note comments concerned about this (I have no idea how many others had their comments deleted, as mine were). There’s also a Facebook group on crowdfunding scams that has taken a special interest in Titan Note with a few different discussions on it — including concern about the current offering directly off the website. Throughout all of this, I still would like the product to be legit, because it certainly would be an interesting product! However, with all of the red flags raised, and the questionable way that Titan Note has responded to these kinds of questions, it seems entirely reasonable to believe that the product is, at the very least, greatly exaggerated, and might possibly not exist at all. I did send Titan Note an email listing out a series of questions and letting them know I would be writing about this. So far, there has been no response. If one should come in, I will update this post. Expanding Access To Medicines: What Role For Transparency?